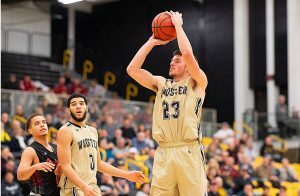 For being the winningest NCAA team of the 2000s, The College of Wooster Men’s Basketball team of the 2018-2019 season only knew one way to live up to the achievements of their predecessors — to come out of the gates with a 4-0 record. The squad debuted their season with a 108-100 win against Muskingum University on Wednesday, Nov. 14, followed by a win against Mount St. Joseph on Nov. 17 to finish up the Annual Al Van Wie/Wooster Rotary Classic. Soon after, the Scots tallied two more wins on the road against Hanover with a score of 57-47 on Nov. 20, and against Ohio Northern University with a score of 61-52 on Nov. 25. The home opener for the Fighting Scots was not your everyday basketball game. The College had just finished major reconstruction of Timken Gymnasium, and this was the first time that the men’s team was performing in front of a huge home crowd in the new, improved arena. With this in mind, the Scots had an extremely rigorous off-season to come out prepared for a home win. “Our off-season was pretty rigorous and intense,” stated Danyon Hempy ’20. “We had open gyms twice a week, lifting four days a week, and we also did plyometric training twice a week.” Hempy added, “We wanted to make sure our bodies were physically ready for the long season ahead of us, and to start the season strong.” Keonn Scott ’21 was in agreement, stating, “This off-season, each player was sent individual workouts they had to do, and work on their game-skill training as well as weight lifting.” Hard work pays off, as the Scots came through to beat the Muskies by eight points to start the season with a W.
The College of Wooster Men’s Basketball Team look to grab a win on the road against the Hiram Terriers on Sunday, Dec. 1. Next, the Fighting Scots will bring the action back home on Dec. 5 against the Allegheny Gators at Timken Gymnasium.